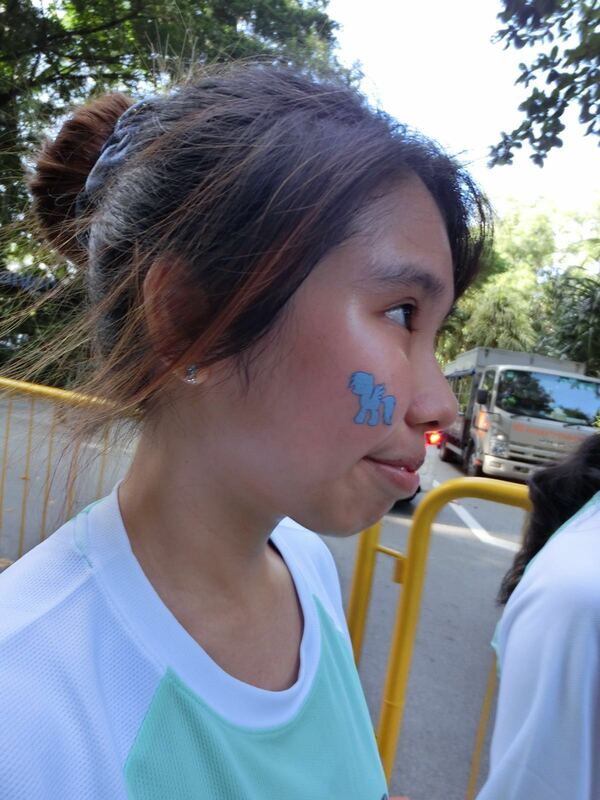 So ya, today i am gonna blog about the Magical Run~ Which is the My Little Pony Friendship Run 2016 organised by Pink Apple Events and sponsored by Hasbro Singapore. And here is the goodie bag! Thanks Elvina Bestie for collecting it for me while i am celebrating Vday at Msia! LOLS! One good thing about this bestie run is that you sign up in pair but only 1 person needed to collect 2 goodie bag. Then the cool thing about this race is they give u a race time tracker to tie with ur shoe lace. Liddat you will know how long u took to run 6km. And also make sure people dun cheat! hahaha! Tadah we are done tying them! Off we walk from the Beach Station Carpark to the starting point. Anyway we were there for 2hrs and we spent $5+ on parking. OMG! Since it is the monkey year, and me and Casper born in the year of Monkey, we will not let any opportunity to take a picture with monkey missed! hahaha! And Casper helped us took a photo too! Guess who i met? It’s Irene Soh from ahsoh.sg! LOLOLS! And Irene’s cute daughter, Sophia! Both of them is so friendly! Pinkie Pie gave birth to Twilight Sparkle! LOLOLOLOLS! Jkjk.. But Irene really put in a lot of effort to dress up! She definitely should win the best-dressed! Irene even DIY the horn and ears for Sophia! And the Tulle skirt is DIY by Irene! I dun have such crafty hands so I shall leave it to the experts at Sweetest Princess Tutu DIY! And of course how can i miss this #FollowGerzTo / #FollowMeTo ?! This is family run / kinship run for me instead of besties run… There are many little girls don in Tutu too! Hahahah! I am one of the oldest girl in Tutu! Let’s have a shot with Pinkie Pie! 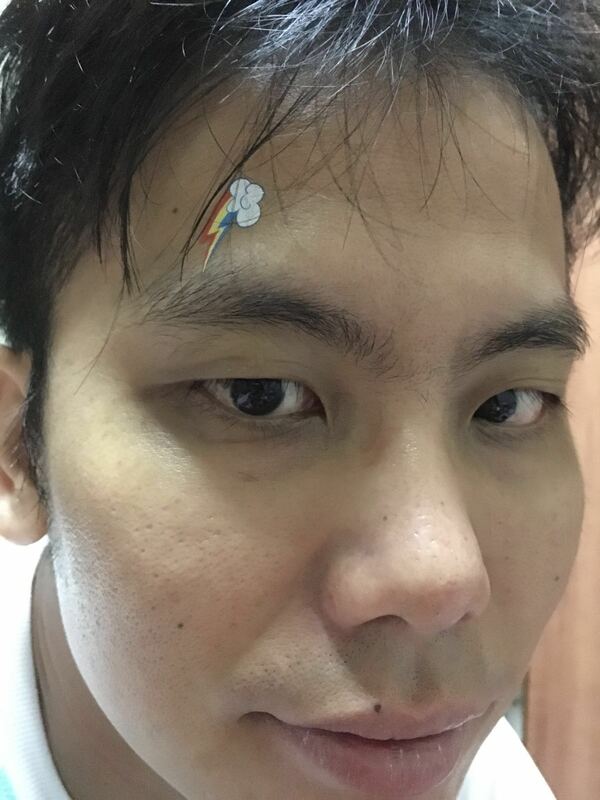 This is my evil Twin, Rainbow Dash! And say hello to Rarity! Here is mum with her favourite pony, Twilight sparkle! And this is Casper with Apple Jack! LOLS! Ah Kes with her Fluttershy! We can see all the 6km bestie runners all fall in liao!! So my flag off timing is 8am. This is the map where we will be running. Now we are walking towards the start line. It’s a 6km run so is still more of a fun run to many so you dont see many people do warm up. My warm up is jus to bend down and take more peektures! And more peektures! Okay enuf said… We are gonna start running soon! Thanks hubby for accompanying me here! His bid is sponsored by me!!! :'( Mum oso wanna play #FollowMeTo -.- LOLS! Mum was so shock to see twilight sparkle lolols! See her shocked face! 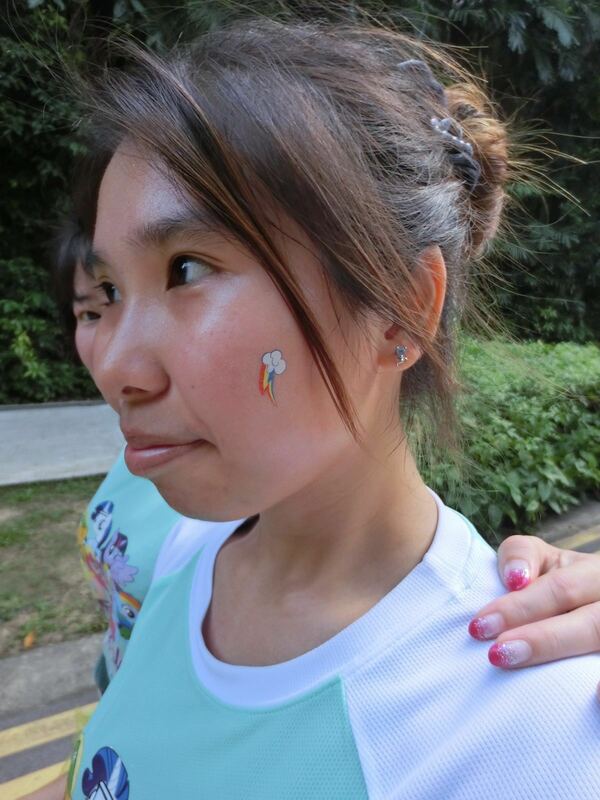 She is like a happy lo~ So for 6km our mascot is Twilight Sparkle, 4km is Rainbow Dash and 1km is Pinkie Pie. Anyway let’s start running! Okay maybe let’s start selfie-ing! And there is 2 runners dress up as Princess Celestia and Luna. Then this guy is My Little Fairy! HAHAHA! okay la.. maybe pinkie pie? Here is the bubble zone~ On my way chionging to 2km.. Mum oso follow me chiong… And ah kes copy us! hahahha! Ok this is uphill so it means walking time! #FollowMeUphill Finally 2km liao worz Water point 1 Better drink more! I will tell u why later..
Hooray~ It’s a sonic rainboom created by me! lolols! U see when Mum reached the 3km mark she was like super happy can?! YAY 3km done! 4KM also done-ed So there is this U-turn sign and mum wanna act as if she has done 6km already..
LOLS mummy, just fyi, 6km run doesnt have 6km mark.. coz it’s the finishing line!!!! 5 km liao!! LAST KM!!!! Finally the 2nd water point…. Actually my Tutu look very nice under the sunlight hor? So now we have to u-turn back to the finishing line which is near the starting line and we get to see rainbow again! We are back at the start of palawan beach.. u can see Kes is holding onto the draw string bag and now carrying it already… Why leh? Coz it broke… Enuff said.. Let’s chiong to the finishing line bah! Oops i chiong abit too fast! Tadah.. the red stripe on the floor is the time tracker. So if u cheat they will know de la. Hooray to mum for completing her first 6km! Let’s collect medal, water and milk. Heng we finish it fast, arbo here will be crowded with alot of people and will be super chaotic! Mummy first medal.. She very touched. Well done mummy! And thanks hubby for being our photographer! Met our friends at the friendship run! L- R : Bernard, Chuer, Min :D Thanks Bernard for taking this photo! Sweetest Princess Tutu DIY: This Rainbow Dash inspired Tutu was customised specially for me and suitable for running. Christine (Seller) knows that this is meant for running events hence she made it puffier (3 layers) of 100% soft nylon material hence it does not scratch my skin. I am also able to choose any colours I like. The current price of the exact same tutu I am wearing is a 8years old kids price and it’s about $45-$50 (as of today). Prices will subject to changes. If you notice, she used crochet waist band hence the tutu skirt does not ride up! Do support her humble business by liking her facebook page too! Hahaha! Someone mentioned I was cute!!! *hooray* Thanks for the compliments @lady_equinox! My Little Pony Run 2016: Well, this run is well organised but there is a few feedbacks from me la. #1: Material of the goodie bag. As it is called Race Pack, hence alot of people majority 80% of runners will run with this bag. But many of the runners incl. us, suffered from this! What is worst? The day before, we still double sewn it using sewing machine. But still it broke. Haizzzz… You may say we put too many things but you gave us 1 can of Gabu Gabu drinks and it cant even tahan the weight of the Gabu gabu?! 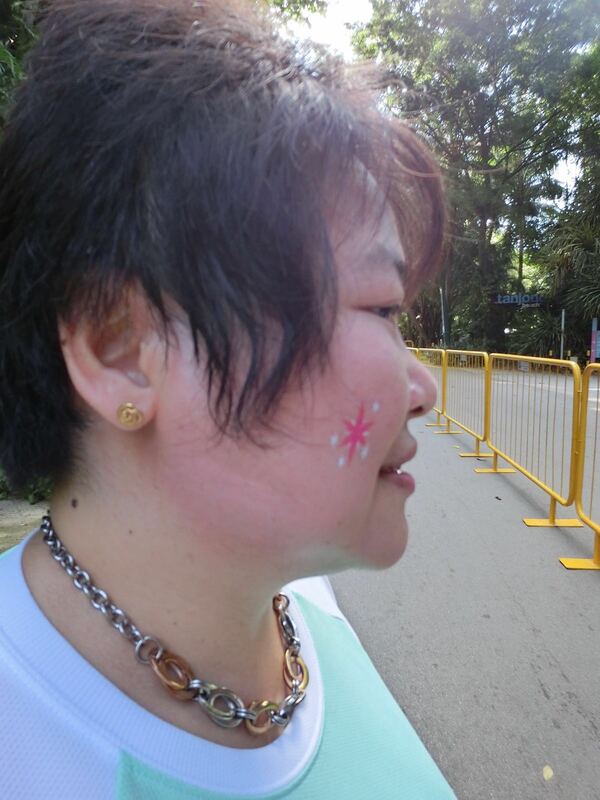 ok……..
Seriously… For 5km run, Hello Kitty run 2016, you give me 2 water point but at 1km & 2km and tats all.. I already find it… WHAT?! This time round you really disappoint me TTM ( to the max)! You gave me 2 water point for a 6KM Competitive Run aka must chiong run and you placed 1 @ 2km another one @ 5km. LIKE WHAT?! 2km one nvm.. Is ok… 5km one is like so FAR!!! You gave us one super sweet Gabu Gabu and you wan me to use tat to “TONG / TAHAN” for 3km of Run then reach ur water point? Although technically by right 4km mus have 1 water point and you are not wrong but many of the 6km participants are “First Time runners” like my mum. This is the first time they doing 6km which is super long for them so you mus do more welfare to encourage them to adopt this healthy running activities as their hobbies and not discourage them. TYPE 3 Bring kids to run the 6km as most Singapore race are 5km or lesser. So as such a family run, relatively fun run.. welfare is important! need be, you shuld give snacks too! HAHAHA! And ya… We are ponies too! WE NEED WATER! Pony dun need water meh? #3 The Quality of the Temporary Body Tattoo! – BAD!!! Keslyn’s Fluttershy cutie mark was torn too. Then u see keslyn’s face tattoo.. SO OBVIOUS dun tell me you CANNOT SEE HOR!!! In the end we wasted about 4-5 tattoos coz it was torn but the rest of the tattoo turns out well for us..
Other than that, the race was good. You have the “running tag” which ties to our shoe lace then people cannot cheat. Then enough medals to go around… For 6km everything was in order basically is liddat. For the $60 run this standard is…. Ok lo.. Acceptable! I just hope the next Pink Apple Run I go to will have more water points! Call me water bucket if you must but lesson learnt, carry your own water when you run! And lastly kudos to all the photo ops moment and the carnival was pretty well done! Although I did not enjoy it coz I am a big kid but I can see alot of kiddos having fun. The memorable moments was the “Rainbow Zone” which you have balloons and “Bubble Zone” where you have bubble machine! Then also you start on the dot this time so it’s pretty awesome! And indeed I have plenty of fun and photo ops moments! hahahahaha! I would love to do this too!